Set amidst a picture-perfect coconut grove, five bedroom Baan Yai accommodates a total of 12 guests in a beautifully constructed villa. Open-air living spaces, a spacious pool and well-landscaped grounds combine to offer the best of tropical living. The ground floor allows for ramp access, and Baan Yai may be rented along with its neighbouring villa, Baan Ya Kha to house up to 20 guests. Five bedrooms house 12 guests at Baan Yai. Three bedrooms are located on the ground floor; two are furnished with a king bed, air conditioner, TV and private en suite, while the third features air conditioners, twin singles and TV set, On the upper floors are two bedrooms, each with king beds, sofas, air conditioners, fans and smart TV sets. 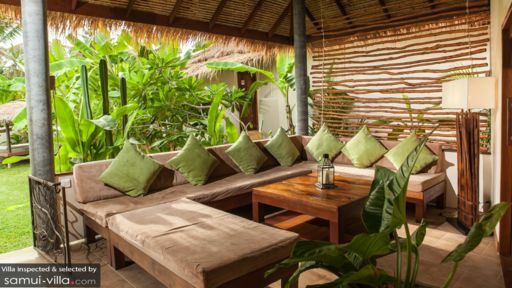 Baan Yai’s beautifully landscaped outdoor compound is ideal for social gatherings or private relaxation. 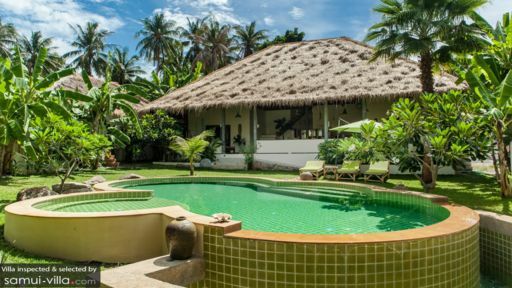 Towering palms and lush foliage surround your villa, creating a postcard-perfect environment. Curl up on the poolside lounge chairs with your favourite reads or cool down with a dip in the free form pool (complete with pool benches and child-friendly wading area). The main living area is bright and airy, thanks to the indoor-outdoor concept and open plan layout. Its pleasingly high ceilings adds on to the sense of spaciousness within, and a colour scheme made up of soft creams, whites and earthy hues creates a soothing, inviting ambience. Enjoy views out to the pool and surrounding greenery as you recline amidst the pillowy sofa in the indoor lounge. The kitchen boasts an open concept, and comes fitted with a full range of cooking appliances and breakfast bar counter. An adjoining dining area comes furnished with a long wooden bench that facilitates communal dining. Movie nights are best enjoyed in an air-conditioned media lounge complete with a 50-inch flat screen TV and convertible king sofa set. The media lounge may double up as the a fifth bedroom to accommodate two guests. Baan Yai enjoys impeccable housekeeping services. 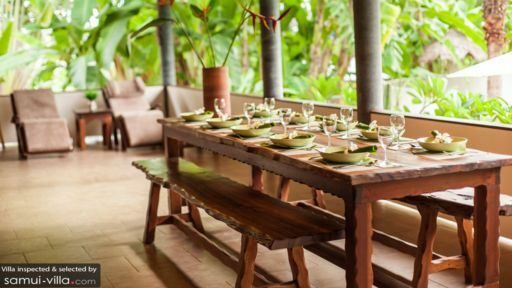 Private chef, in-villa massages and Thai cooking classes may be arranged at additional cost. Local amenities are scattered all around Ban Yaai. There’s a 24/7 7-11 convenience store just 200 metres away, while a pharmacy and bakery are easily within reach. There’s plentiful options for dining: Romanzo Tropicale is a great bet for tasty Italian fare and sundowners, L'Alcôve offers French dishes in a cosy bistro setting and Belgian Beer Bar features an extensive selection of beers with hearty Belgian fare. Hin Kong Beach is 150 metres away from your villa. It’s great for beach strolls and relaxing by the coast, but if you’re into a livelier atmosphere and vibrant nightlife, hop into a car for a 20-25 minutes ride to Haad Rin Beach. It’s the most popular beach on the island, and is the venue of choice for Koh Phangan’s famous monthly Full Moon parties. For a restful stay on the island, step away from Haad Rin to one of the island’s open-air yoga studios. Drop-in classes are available at Orion Healing Center (three minutes’ drive), Gaia Yogashala Koh Phangan (five minutes’ drive), Samma Karuna Yoga (seven minutes’ drive) and The Yoga Retreat (12 minutes’ drive). Being out in nature can feel incredibly rejuvenating too; there’s Khao Ra, a viewpoint that offers a half-day hike and Than Sadet Waterfall, where you’ll enjoy hiking among its massive pools.